To shade Jonah from the sun. "Go to Nineveh, that great city, and preach to it; for its wickedness rises up before me." But Jonah did not wish to preach to the people of Nineveh; for they were the enemies of his land, the land of Israel. He wished Nineveh to die in its sins, and not to turn to God and live. So Jonah tried to go away from the city where God had sent him. He went down to Joppa and took a ship for Tarshish. "What do you mean by sleeping in such a time as this? Awake, rise up, and call upon your God. Perhaps He will hear you and save our lives." "There is some man on this ship who has brought upon us this trouble. Let us cast lots and find who it is." "Tell us, who are you? From what country do you come? What is your business? To what people do you belong? Why have you brought all this trouble upon us?" "What shall we do to you, that the storm may cease?" "Take me up and throw me into the sea; then the storm will cease and the waters will be calm; for I know that for my sake this great tempest is upon you." "We pray thee, O Lord, we pray thee, let us not die for this man's life; for thou, O Lord, hast done as it pleased thee." At last, when they could do nothing else to save themselves, they threw Jonah into the sea. At once the storm ceased, and the waves became still. Then the men on the ship feared the Lord greatly. They offered a sacrifice to the Lord, and made promises to serve him. And the Lord caused a great fish to swallow up Jonah; and Jonah was alive within the fish for three days and three nights. In the fish Jonah cried to the Lord; and the Lord caused the great fish to throw up Jonah upon the dry land. Notice all through this story that, although Jonah was God's servant, he was always thinking about himself. God protected Jonah and saved him, not because he was such a good man, but because he wanted to teach him a great lesson. "Within forty days shall Nineveh be destroyed." And the people of Nineveh believed the word of the Lord as spoken by Jonah. They turned away from their sins and fasted and sought the Lord, from the greatest of them even to the least. 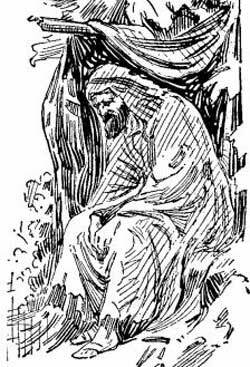 The king of Nineveh arose from his throne, and laid aside his royal robes, and covered himself with sack-cloth and sat in ashes, as a sign of his sorrow. And the king sent out a command to his people that they should fast, and seek the Lord, and turn from sin. "O Lord, I was sure that it would be thus, that thou wouldest spare the city; and for that reason I tried to flee away; for I know that thou wast a gracious God, full of pity, slow to anger, and rich in mercy. Now, O Lord, take away my life, for it is better for me to die than to live." "You were sorry to see the plant die, though you did not make it grow, and though it came up in a night and died in a night. And should not I have pity on Nineveh, that great city, where are more than a hundred thousand little children, and also many cattle,--all helpless and knowing nothing?" And Jonah learned that men, and women, and little children, are all precious in the sight of the Lord, even though they know not God.